One of the most persistent but unaddressed problems in the United States is our massive racial wealth gap. Wealth provides an important cushion from the threat of unemployment, medical emergency or other unforeseen events. Wealth can also help pay for college, the start of a new business or the purchase of a first home. However, most Americans struggle with debt. A recent Federal Reserve Report finds that of Americans who had savings before 2008, 57 percent reported using up some or all of their savings in the aftermath of the recession. However, wealth and debt are not distributed equally (see chart). 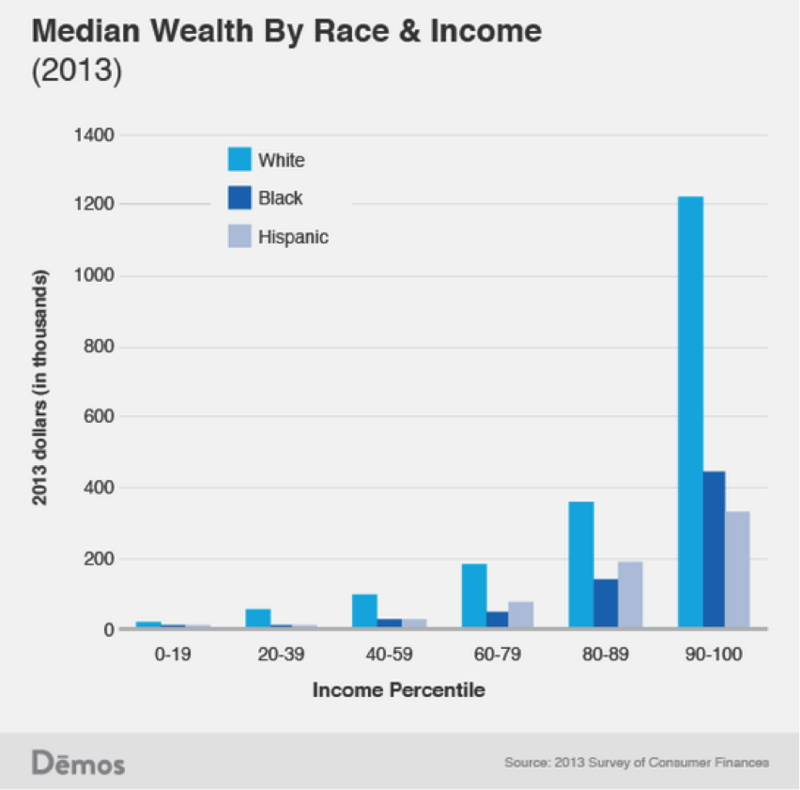 The racial wealth gap is caused by the fact that wealth is passed from generation. As Gregory Clark notes in his recent book, "The Son Also Rises," the residual effects of wealth remain for 10-to-15 generations. Given that most Americans are only four generations removed from slavery and one generation away from segregated neighborhoods, restrictive covenants and all white colleges, the only truly surprising fact is that the racial wealth gap is not larger. America is also uniquely susceptible to persistent wealth gaps because of our low inheritance, estate and capital gains taxes and the fact that what minimal taxes exist our fraught with loopholes. In 2010, the richest 400 households took home 16 percent of all capital gains (a sweet $300 million each), but paid the same tax rate as a worker making $80,000. At the same time, a loophole in the tax code has allowed the wealthiest to avoid $100 billion in estate and gift taxes since 2000. On the other side, our public school system is profoundly discriminatory, our neighborhoods deeply segregated and access to credit is racially discriminatory. 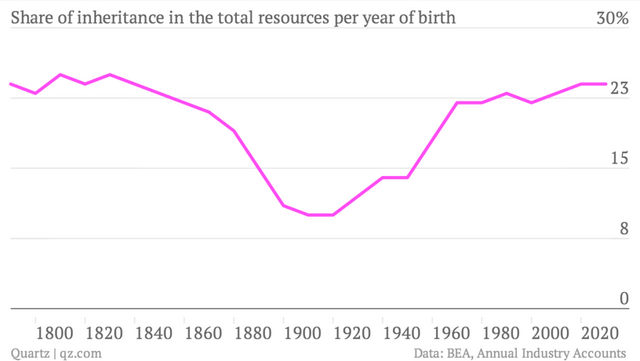 As Thomas Piketty recently demonstrated, “In terms of total amounts involved, inheritance has thus nearly regained the importance it had for nineteenth century cohorts” (see chart). The biggest myth of the racial wealth gap that must be demolished is that education or rising incomes can eradicate it. As Matt Bruenig has persuasively shown, this argument is laughably absurd. 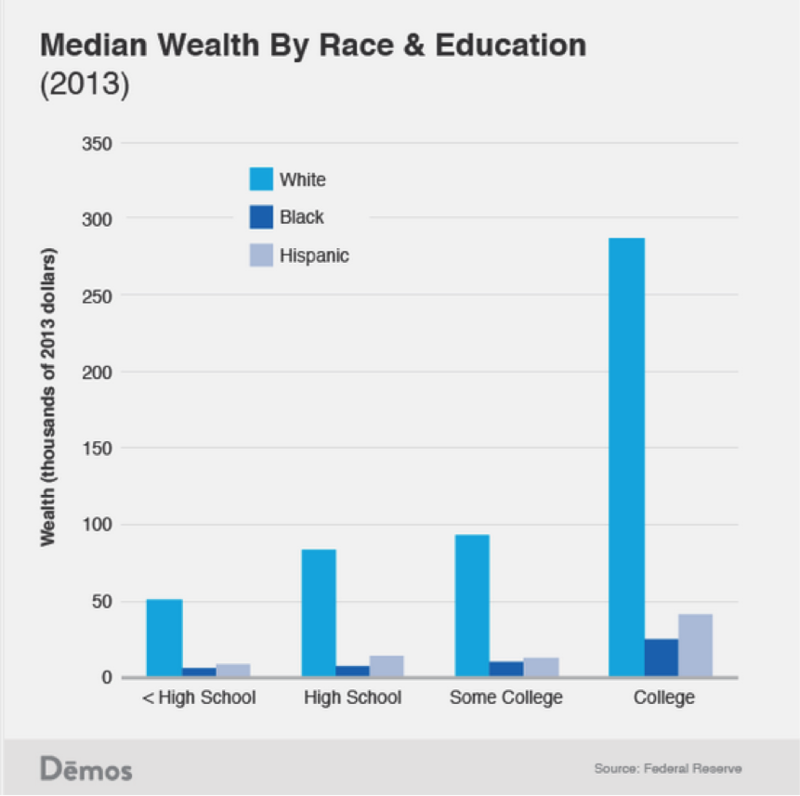 College educated Blacks have less wealth than white college drop-outs (see chart). Bruenig also shows that high income Blacks and Hispanics also have less wealth than whites (see chart). Between 2007 and 2010, all racial groups lost large amounts of wealth. However, the wealth reduction fell disproportionately on Hispanics and blacks, who saw a 44 percent and 31 percent reduction in wealth (compared to an 11 percent drop for whites). This was due to blacks and Latinos disproportionately receiving subprime loans, both because of outright lending discrimination and housing segregation.A recent research brief by the Institution on Assets and Social Policy finds that the wealth gap between white families and African Americans has tripled between 1984 and 2009. They find five main factors responsible for driving the gap, which together explain 66 percent of the growth in inequality. The factors, in order of importance, are number of years of homeownership, household income, unemployment, college education and financial support or inheritance. 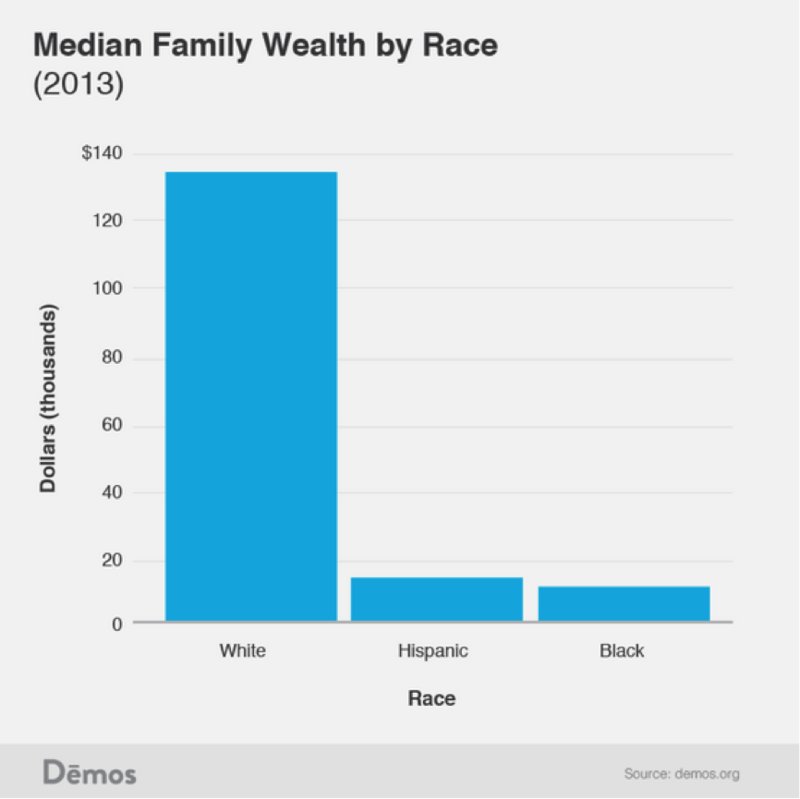 The most frustrating problem with the racial wealth gap is that it is not abating. 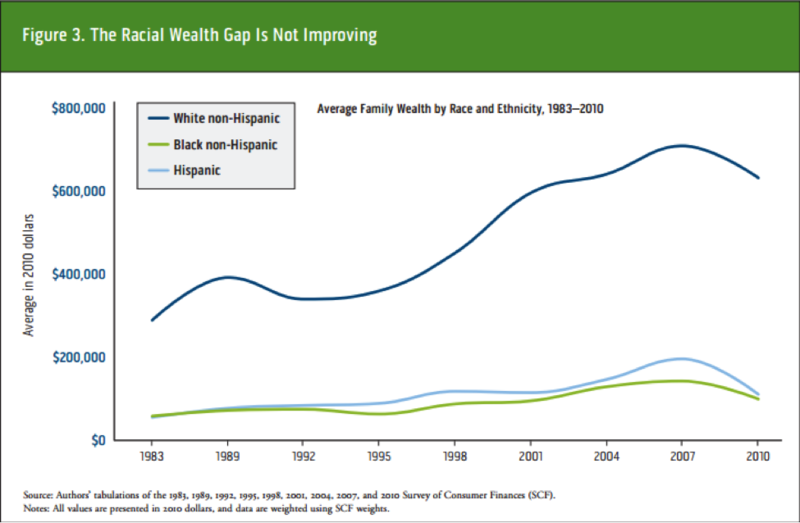 While half of whites say that “a lot” of progress has been made towards Martin Luther King Jr.’s dream, the data show that the racial wealth gap has only increasing since 1983 (see chart). There are several important public policy changes that can alleviate the racial wealth gap. The first is to prevent the further accumulation of debt. While debt is often seen as a problem attributable to individuals, the academic literature is clear that broader economic forces are at largely responsible for the run-up of debt. Credit card debt is particularly harmful for people of color who often face discriminatory lending practices. A recent study of credit card debt finds that people of color pay a far higher IPR on average than white borrowers. The CARD act has already been a boon to consumers, but underlying drivers of debt, such as rising inequality, retirement insecurity and lack of health insurance must also be addressed. Higher education debt must also be addressed. Research from Demos finds that if “current borrowing patterns continue, student debt levels will reach $2 trillion sometime around 2022.” However, student debt is not distributed equally, but rather falling primarily on students of color and low-income students. That’s because in our age of austerity, governments are spending less money on higher education, shifting the burden of paying for college onto students. Federal and state governments need to step up and fund an investment in the next generation. On the other side, however, we must also foster wealth-building initiatives. Historically, homeownership has been a pathway to the middle class, but deep residential segregation means that Blacks and Hispanics often own homes that are far less valuable than white homes (see Table 3). Further, in the wake of the crisis many banks are buying up foreclosed houses and renting them out. That means income for people of color is no longer becoming wealth for people of color, but rather wealth for rich bankers. One solution would be a first-time homeowners tax credit that is weighted to benefit low and moderate income households, rather than the mortgage interest deduction, which favors the wealthy. FICO credit scores should replaced with more reliable credit measurements. But the ideal way to reduce wealth inequality, not only between people of color and whites, but also between the richest .1 percent and the rest of us, is a baby bond. A baby bond is an endowment given to Americans at birth and maintained by the federal government until they are 18. The bond functions in a similar way to Social Security and can be sued to pay for college, buy a house or start a business. Hillary Clinton, in fact, briefly floated the possibility of a baby bond during her 2008 campaign, although the modest $5,000 sum she proposed is certainly smaller than ideal. Britain briefly experimented with a baby bond proposal, although it later became the victim of Tory Austerity. Dr. Darrick Hamilton and William Darity Jr., leading proponents of a baby bond, propose a progressive bond that caps at $50,000 for the lowest wealth quartile bond could close the racial wealth gap in three generations. Their proposal would be given to three-quarters of Americans (based on wealth eligibility). They estimate that such a program would cost $60 billion a year, about one-tenth of the 2014 defense budget. The baby bond need not increase the deficit. A recent CBO report finds that right now, tax credits primarily benefit the wealthiest, at a cost of nearly $1 trillion a year. This money could easily fund an extensive baby bond program that would, over time, eliminate the racial wealth gap. Another option would be to restore progressivity to our tax system. Because the baby bond program would not be explicitly targeted at people of color but rather would benefit most Americans, it could easily win broad support (much as Social Security is currently untouchable). Any presidential candidate should make the baby bond a central plank of their 2016 if they want to seriously address the problem of wealth inequality. Without such a proposal, wealth, and therefore political power will become increasingly concentrated in the hands of a small elite. It may already be too late. Sean McElwee is a Salon contributor and a policy analyst at Demos Action. His writing may be viewed at seanamcelwee.com. Follow him on Twitter at @seanmcelwee.